It’s the classic storybook narrative; a young outcast with a troubled past runs away from home to join the circus in pursuit of a better life. But for former top-level gymnasts Talita De Lima, Ion Ciacla and Denis Pirogov, the fiction is their reality. 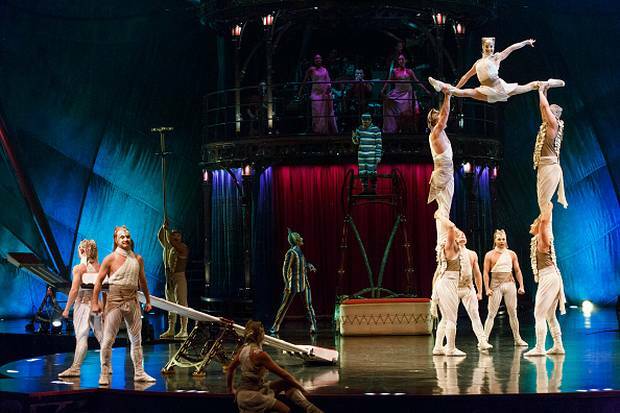 The trio, from Brazil, Romania and Russia all called time on their sporting careers in search of a more exciting lifestyle and now perform together as teeterboard artists in Cirque du Soleil KOOZA. With massive sacrifices and drastic changes in lifestyle, running away with the circus hasn’t been all smooth sailing. But there are also no regrets. Every night that 29-year-old De Lima steps out on stage to be catapulted from a teeterboard to spin, twirl, and land on the shoulders of a fellow acrobat in front of hundreds of people, she takes a moment to think of the life she left behind. Growing up in an underprivileged neighbourhood in São Paulo, Brazil, De Lima always searched for ways to escape her reality. At the age of five, she was introduced to artistic gymnastics and quickly excelled to the top of the sport, taking out local and national tournaments. She was marked as having plenty of potential in the sport but after nearly 14 years of training and competing as a gymnast, De Lima longed for a change. She grew tired of her routine and was discouraged by the lack of opportunities in Brazil. De Lima set her sights on the world-renowned circus and her opportunity finally came in 2008 when Cirque du Soleil held auditions in São Paulo. Out of 30 candidates, only three were chosen to proceed to Cirque du Soleil’s international headquarters in Montreal, and De Lima was one. Leaving her life and family behind, De Lima relocated to Canada in 2009 to begin training and joined KOOZA’s house troupe less than a year later. But although her strong gymnastics background came in handy, De Lima had never trained nor performed in teeterboard. “The only thing the same was knowing how to jump and tuck,” she says. Ciacla, 28, watched his first circus show at the age of six after his parents signed him up for artistic gymnastics classes. Following six years of national level gymnastics, Ciacla began transferring his skills to acrobatics and at just 12-years-old, auditioned and landed his first circus gig. Picking up a professional performer contract in 2003, Ciacla relocated to Las Vegas to perform at Planet Hollywood as part of the teeterboard act before joining the Moscow State Circus Teeterboard in the US, touring all 50 states over a two-year stint with the show.